There is no doubt about the fact that Lettuce funk is one of CYM’s favorite groups out there today. Their fresh, funky, uplifting and exploratory spin on one of the most loved genres soothes our souls and brings harmony to the musical universes of our lives. Last year the band partnered with Live for Live Music, Purple Hat Productions and Silver Wrapper to throw their first official Fool’s Paradise festival in one of America’s most historic cities, St. Augustine, Florida. 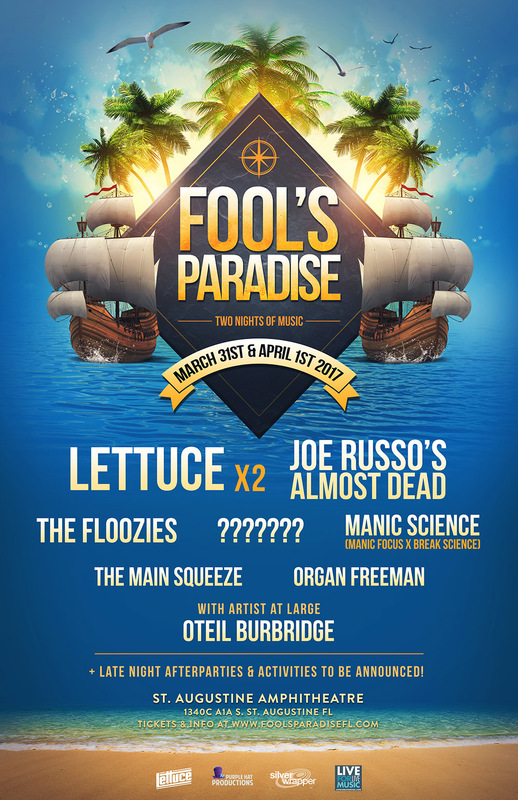 The inaugural year was a funkalicious spectacle and the second Fool’s Paradise is set to return to the St. Augustine Amphitheatre March 31st & April 1st, 2017. The first wave of artists just dropped…as did our jaws when we saw it. The two day event will feature two Lettuce sets (and bankin’ on some surprise appearances and collaborations throughout the weekend), Joe Russo’s Almost Dead, a unique Manic Science set (Break Science + Manic Focus), The Main Squeeze, LA-based groove band Organ Freeman and Dead & Company and Allman Brothers bassist Oteil Burbridge as an Artist at Large both days! The festival is primarily a musical event but Lettuce inform you that last year’s time included awesome outdoor excursions and fun activities led by no other than members of Lettuce. Just steps away from the beach, the venue offers its guest multiple lodging options at close hotels as well as different camping options in and around Anastasia State Park to fully enjoy your Fool’s Paradise funk-filled weekend at the beach the way your squad wants to. Yet to be announced are even more musical guests, extracurricular events, late night after shows across the street from the venue and more. St. Augustine is roughly one hour from Jacksonville, one hour from Gainesville, and two hours from Orlando. The oldest city in the United States and fabled home to the Fountain of Youth, St. Augustine’s unique scenery and historical presence sets the city apart from any other in the country. With over 42 miles of beaches, incredible restaurants and bars, oceanic activities, and historical adventures galore, there is no shortage of ways to make the most of your Florida adventure! Two-Day Passes & VIP Packages On Sale Fri. January 13th HERE. VIP packages will include reserved seating in front of the soundboard, priority access to the pit area, artist happy hour, discount alcoholic beverages, event poster and t-shirt, and a ticket to the late night concerts at Elk’s Lodge. Hotel packages include lodging, transportation, and VIP tickets to the event.